Pre-cool-down selfie with Grace. She slept the whole time! I got up yesterday morning thinking I’d catch the metro to go for a run* downtown with Jasmine, only to discover that it doesn’t open until 7. WUT. Washington DC, it’s like I don’t even know you anymore. Yesterday, I had a blast running with Jasmine. 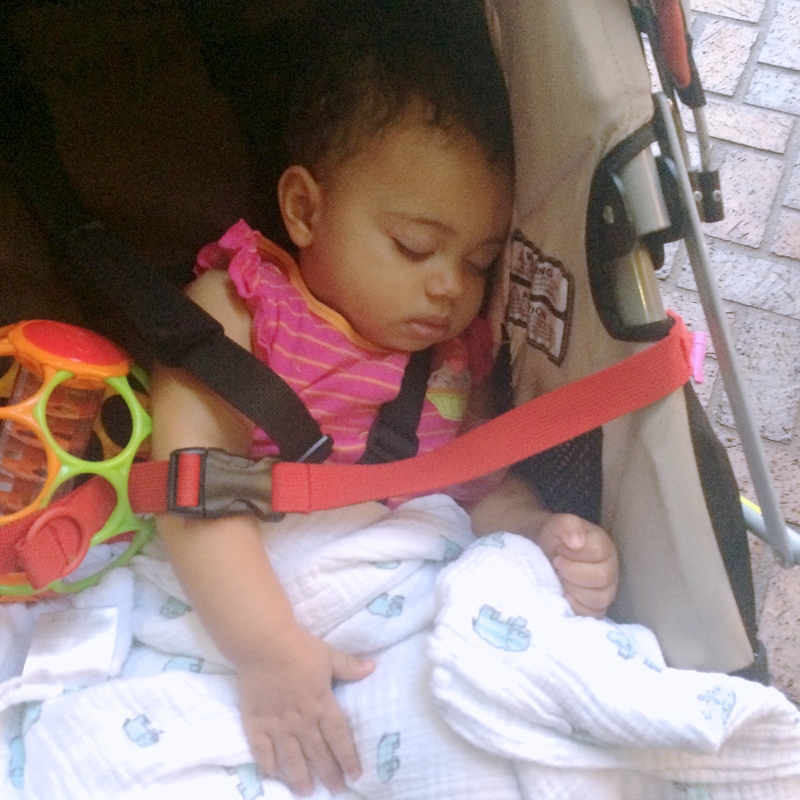 I expected her to fall back asleep in the stroller, but yesterday, she got really into the workout! She insisted on getting out and running and walking with me (such that she could), and then at the end, stretched with me too. SO MUCH FUN. It’s true. 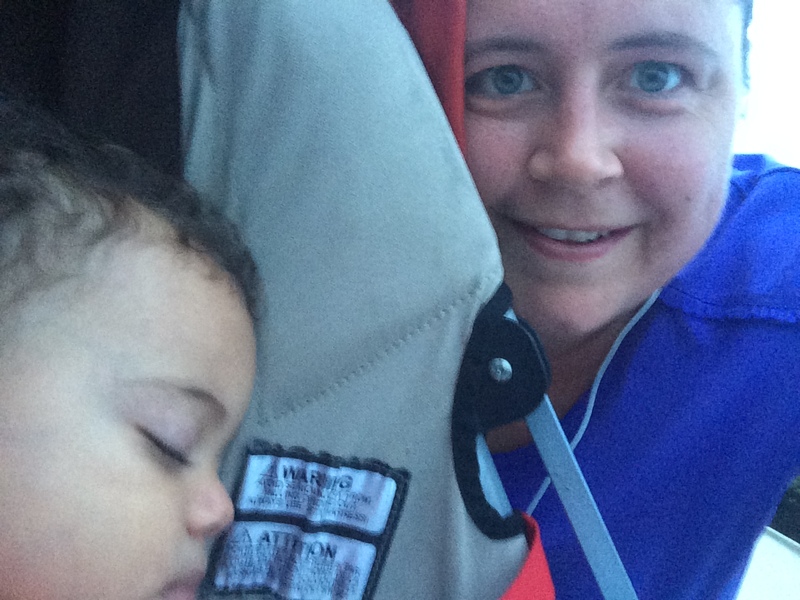 My favorite running buddy is a two-year-old. Today, Jasmine didn’t want to get up. The noise we made discussing the relative merits of sleeping vs. going out woke Grace up. Since Grace didn’t seem inclined to go back to sleep right away, I went ahead and brought her with me. Just kidding. She was out like a light the second we got outside. Sweet sweet Grace. Easier to run with than Jasmine, but not as much fun to stretch with afterwards. I run outside on the weekends with Jasmine (and now Grace) to get used to running with a loaded down stroller. Turns out, I love running outside, and running outside is way easier for me than running on the treadmill (MapMyRun says I run slower). This is a good thing. At this point, it’s better for me if I train hard on the treadmill, where it’s easy to pace myself, and then relax on my longer outdoor runs, I think. This morning, I was surprised at how much I was looking forward to the run, and then how damn happy I was while I was running. I can’t believe it’s taken me my entire adult life to figure out how much I need this. Certainly, it’s cheaper than therapy. Watching the sunrise over the Washington Monument was beautiful, and something I could get used to doing on a regular basis. The best part is that when I got back this morning with Grace, Jasmine bounded out of bed and asked me if it was time to go run! She was bitterly disappointed that I’d already gone, since she hadn’t wanted to get out of bed. She made me promise to take her next weekend, no matter what, even if she didn’t want to wake up (that’s a pretty advanced sense of time and self-awareness, for a two-year-old). And that, of course, is why I do this. The personal benefits are great. But encouraging activity and a love of the outdoors in my kids? Worth it at any price.